In November, the Backyard Series organized the event that launched Satellite, another new space in Bridgeport. The launch involved four musicians and hip-hop artists, four poets, four visual artists, and various DJ sets distributed throughout the venue and throughout the night. The line-up was balanced—seventy-five percent artists of color, twenty-five percent white, fifty percent women, fifty percent men—and reached beyond the elite art school circuit. Both Nyman and the Satellite residents recall the atmosphere of respect and celebration that marked the event. For Nyman, the launch meant an expansion of the project, out of the backyard, and into new categories of art. It was also where she started “50EACH,” a series of flyers featuring the artists on the Backyard Series and distributed for free during events. In February, the Series scaled up further with two larger events in the context of Black History Month. 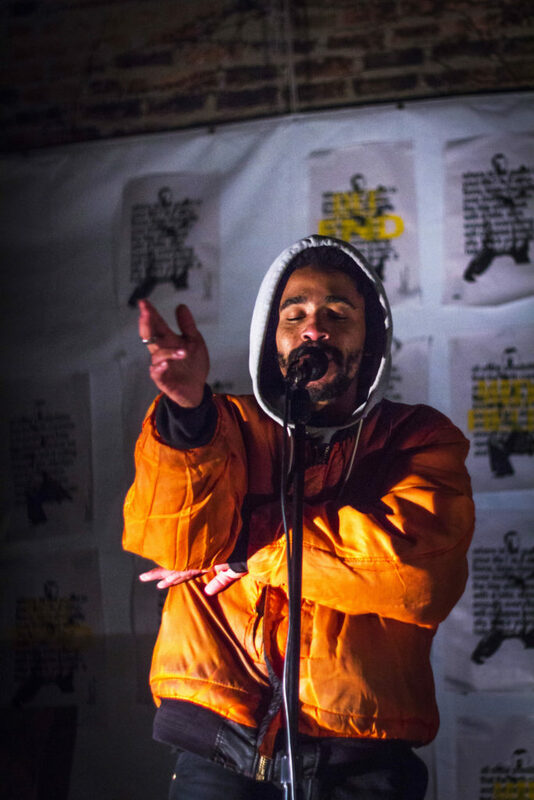 Nyman collaborated with hip-hop artist Ano Bank$ to host “One Drop: A Celebration of the African Diaspora,” which brought music, visual art, live painting, dance, and gastronomy to the Experimental Station. Just a week later, the Backyard Series organized an open mic night and seven main acts with Black performers at the Hairpin Arts Center, located in Logan Square, in conjunction with the exhibition “Don’t be Scurred: Pathways to Liberation.” Since the exhibition had featured so many people related to the School of the Art Institute of Chicago, the organizers of “Don’t Be Scurred” wanted to work with Nyman on creating an event that brought artists from outside of the dominant art school network. Nyman is proud of how much the series has grown: “To go from the backyard to the friend’s living room to Experimental Station and Hairpin Arts Center, on two sides of the city, [to the] Woodlawn-Hyde Park area to Logan Square—I mean, it was a feat”. She emphasizes the importance of other people in this growth. The poet and performer Tyyuhnuh has introduced her to new poets, while other connections have introduced her to new talent—Avantika Khanna facilitates equipment for the events. Her friend Jihoon Woo voluntarily edited the high-quality promotional video documentation for the event at the Hairpin Arts Center. Since October, Nyman has worked with forty-five artists, with twelve more coming for her next event. Nyman also plans to improve the design and production quality of her shows. Her goal is to turn 50EACH into an accessible online publication, where artists and organizers can gain permanent recognition. Marina Resende Santos is a contributor for the Weekly. She works with art administration and research in the humanities and graduated with a degree in Comparative Literature from the University of Chicago. Her interviews with artists and organizers have appeared in Lumpen Magazine and THE SEEN. This is her first story for the Weekly.